While transferring data, you might find a lot of problems. For example, if you are using a USB and transferring data from your old phone to your computer and then to your new phone, it will take up a lot of time and the process may even hang due to the transfer of large amounts of data. What's more, transferring contacts between two Android phones is much more difficult than transferring other media files like photos, videos and music, especially when we can not insert the SIM card of the old phone into the new phone directly. Then, is there any way to transfer contacts from an old Android phone to the new Samsung Galaxy S8 smartphone? Restore from backups - for when you want to retrieve the data from your backups (Available on Mac version). Another option for erasing your old phone data permanently is coming soon. This will help you protect the privacy of your data and prevent of from getting leaked in case you are giving your old phone away. 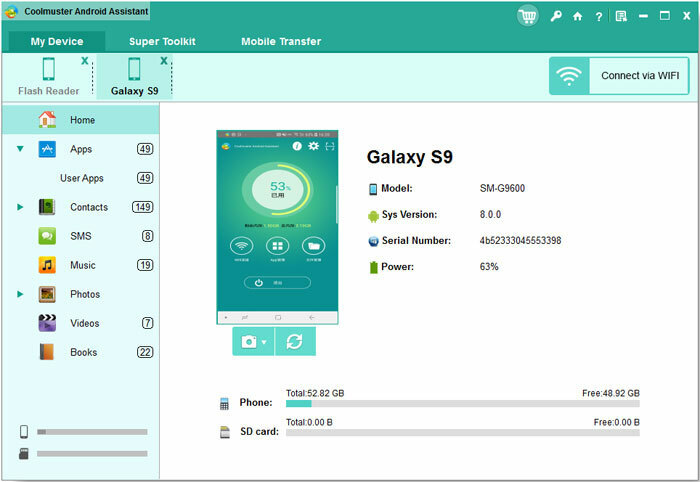 In the last article, we talked about how to transfer data from old Galaxy S6/S7 to new S8. Then, how to transfer contacts from an old Android phone to new Samsung Galaxy S8 by using the Mobile Transfer? 3 steps are enough! Just click the following button to download the right version of the software and then read the following guide. Link your old Android mobile phone and new Samsung galaxy S8 to the computer where you have the Coolmuster Mobile Transfer downloaded and installed, with the help of two USB cables. Then, the two phones, as well as all transferable file types are displayed here. From the list at the top, select, whatever you want to transfer - contacts, photos, music, videos, books, apps etc. Here, if you only want to transfer contacts, you can select "Contacts" option only. Then, select the contacts you need and click the "Start Copy" button to begin the contacts transfer process. Thus, you can transfer all your contacts from your old Android phone to your new Samsung Galaxy S8 with just one click. You can also depend on an Android backup and restore tool such as the Coolmuster Android Assistant or Android Assistant for Mac to back up your Android phone contacts on your computer and then restore them to your new Samsung Galaxy S8 or S9/S9 Edge. Android Assistant is a third-party program that helps users to back up data and restore them to Android device. You can also use it to transfer data between Android and computer. Please firstly download this Android backup restore tool on your computer and check out how it transfers contacts from Android to Samsung Galaxy S8/S9/S9 Edge. Step 1. After you install the Android Assistant, launch it and then connect your old Android phone to the same computer via a USB cable. Open USB debugging mode on your Huawei phone and it will be detected by the program soon. Step 2. 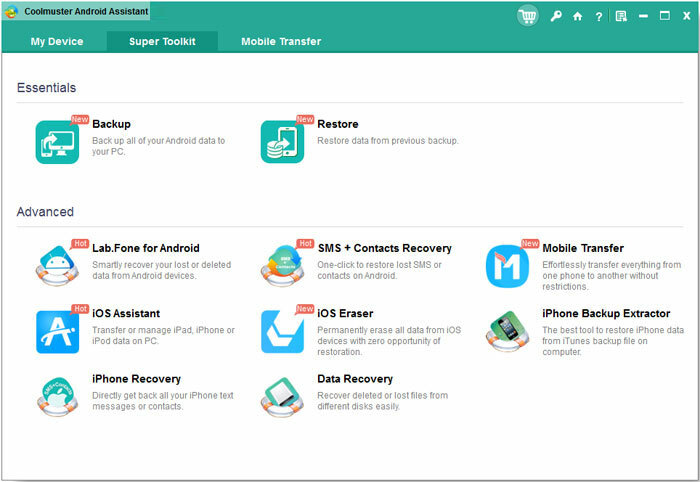 After your old phone is detected by the program successfully, you can go to "Super Toolkit" from the top menu from the program interface and you will enter the 1-click backup and restore window, where "Backup" and "Restore" options are displayed here. Step 3. Click on the option of "Backup" and you'll enter the 1-click backup window. 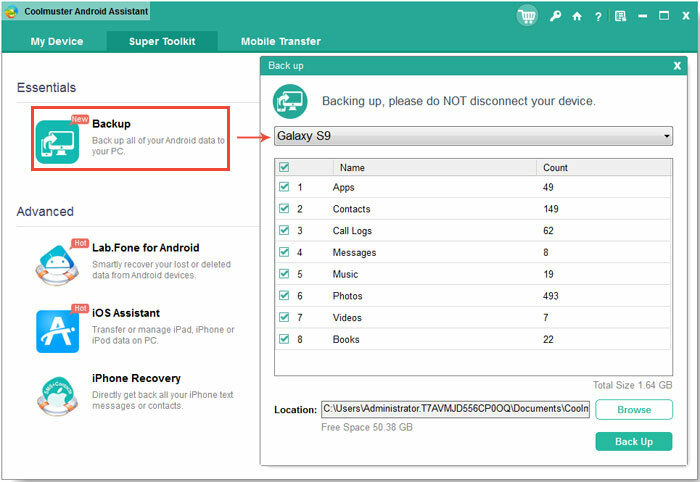 Select the contents you want to back up from your old phone and click on "Back Up" button to save them to the destination. Once the backup process is complete, please disconnect your old Android phone from the computer. Step 4. Connect your new Samsung S8 or S9 to the computer and wait until it is detected by the program. 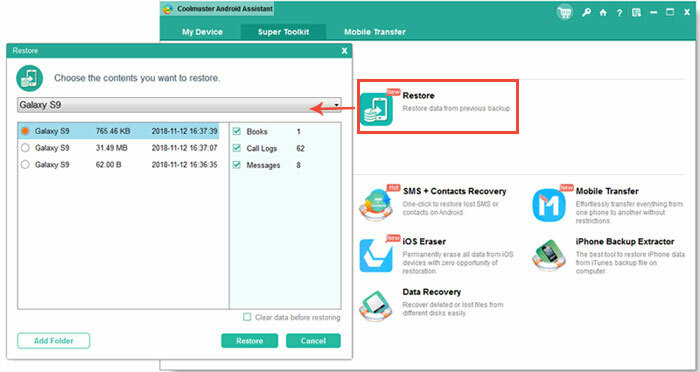 Then, go to click "Super Toolkit" > "Restore" option from program interface and choose the backup record of your old phone. Select the file types you wish to restore and then click on "Restore" button to start restoring your selected files to the linked S8/S9. To copy contacts from an old Android phone to your new Samsung Galaxy S8 or S9, you can try to use Bluetooth. If you don't know how to do that, below is the step by step guide to help you out. Step 1. Turn on Bluetooth on both your old Android phone and Samsung S8. Step 2. Go to the Contacts app on your old Android phone and choose the contacts you want to transfer to S8. After ticking off all the contacts you need, you can tap on the "Share" button and choose "Bluetooth" option. Step 3. Pair the two devices with each other and then choose the new Samsung S8 as the target device to receive the selected contacts. Then, you can send the contacts as a vCard file to S8. Step 4. Finally, you can go to your new Samsung Galaxy S8 and confirm to receive the data transferred from the old Android phone. Then, all the selected contacts will be imported to the Contact app on your S8 automatically.